On the following webpage you will find more information about implemention of motion detection function with your C# camera application using the Ozeki Camera SDK. With the help of this article you will be able to successfully set a threshold and detect motion events in the captured video stream. In order to succeed, OZEKI Camera SDK has to be installed and a reference to OzekiSDK.dll has to be added to your Visual Studio project. Motion detection marks a change in the position of an object relative to its surroundings. It is enough sensitive to recognize the slightest motion changed in the picture. This function became extremely popular in the field of security systems. People usually use it for monitoring their home, their stores or public areas where it is needed to obtain security. Another example for the effective use of motion detection is that you can benefit from it if you want to track the security of your home. If you are a businessman with more hectares of manufactoring factories or you are the manager of a prison you may pay attention to stealing, or escaping from the jail during the night. With motion detection you can easily recognize these kinds of crimes as well. In the case of night records it is possible that the quality of the recording will not be satisfactory. If you use the motion detection function of the Ozeki Camera SDK you will be able to detect motion events in the captured video stream even at night, which increases efficiently the security of your home or your business. 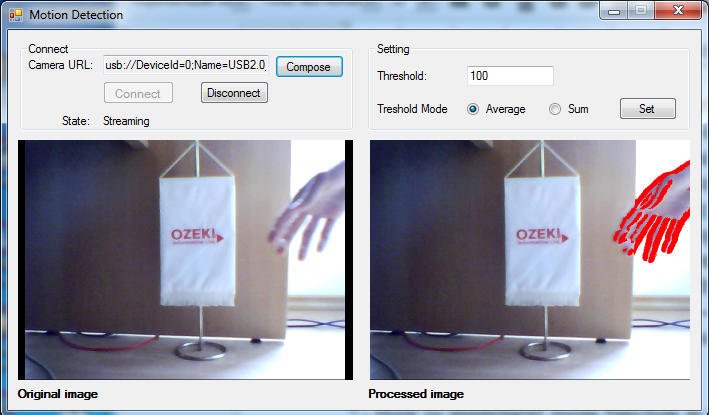 This lecture provides you detailed information on the useful motion detection function of the Ozeki Camera SDK. On this page you can find examples and implementation for setting a threshold and detect motion events in the captured video stream using your C# camera application.